Will the Cannery site survive or disappear? You decide March 28th at 7pm at Craig City Hall. The City of Craig purchased the old cannery site in Craig in 2007 for the purpose of developing a new harbor and support facilities. The purchase included 5 acres of uplands and 5 acres of tide and submerged lands. The city has been working on development of the harbor with the US Army Corps of Engineers. The city has completed the environmental and economic feasibility study on the site and is currently working with the USACE on the preconstruction engineering and design (PED) phase of the project. The city will also develop some of the uplands to support the new harbor. 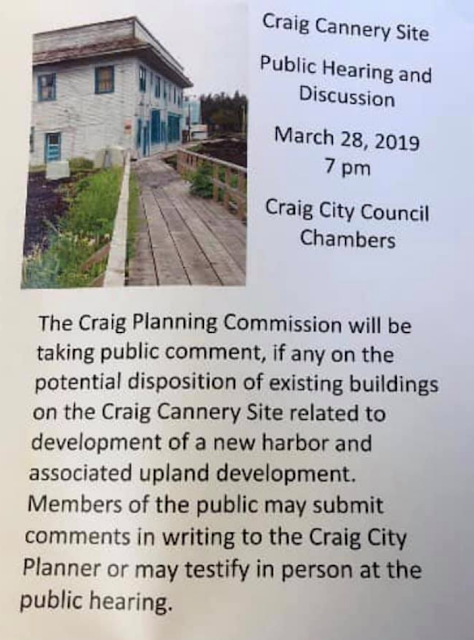 The Craig Planning Commission and Craig City Council will be discussing the project and making decisions on the upland development in 2019.